It Devours! is actually a Night Vale book. 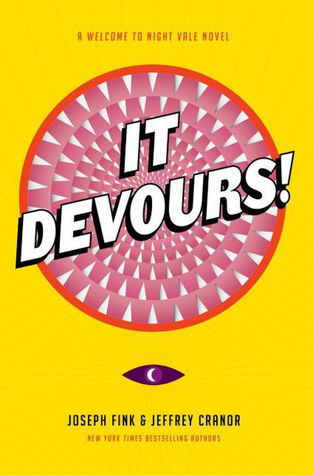 Night Vale started out as a podcast and hooked enough of a following to encourage even more stories from the fictional futuristic semi-dystopian town to be put in the world, this book included. It Devours! centers around Nilanjana, a scientist who ends up investigating how a local organized religion that worships “the smiling god” could be related to the giant sinkholes appearing all over town. That description in itself should sort of paint a clear image of how potentially campy and fun this story could be given the b-movie horror genre vibe it gives off. It Devours! may evoke that, but is actually a well-written story that’s got a fresh tone and a distinct voice. In fact, I’m thinking Sin City (but not as dark and gritty) or The Twilight Zone (but not necessarily as bizarre). It is a good blend of genre elements, while at the same time keeping things accessible and relatable. While it’s not my usual fare for my go-to stories, and isn’t going on my re-read pile, I will say that I kind of want to get into Night Vale now. I have an obscure and little known love for stories set in the same place with the same general theme, and It Devours! was a fun ride that makes me want to discover what else happens in Night Vale.